Liad Yitzhak, a researcher from the Center for Near East Policy Research, We asked each government as to what steps they are taking to ensure transparency of funds to UNRWA. Almost every government assured us that UNRWA implements “rigorous” standards of transparency. We find no evidence of any “rigorous” standards of transparency in UNRWA. The EU and its Member States are proud to support UNRWA’s work in providing essential services to Palestine refugees, which should be seen as an inseparable part of the EU’s efforts to reach a negotiated two-state solution and a just and lasting peace between Israel and the Palestinians. Please see also the Statement by the Spokesperson on UNRWA from 1 September 2018. The EU and its Member States are collectively the largest contributors to UNRWA. In 2018, the EU and its Member States contributed around USD 644 million to UNRWA .UNRWA publishes its donor contributions, which can be found here: https://www.unrwa.org/how-you-can-help/government-partners/funding-trends/donor-charts. In 2018 the EU contributed around USD 179 million to UNRWA. UNRWA has rigorous processes and mechanisms in place for the implementation and enforcement of its rules, regulations and policies relating to UN neutrality. This includes biannual checks of staff names against the relevant UN sanctions list and regular inspections of its installations. Through its education programme, UNRWA also promotes universal values and the principles of the United Nations, and a system is in place to ensure that the host governments’ curricula implemented in UNRWA schools reflect these values. By implementing its activities directly through its own staff, UNRWA maintains strong control over the spending of donor funds. UNRWA is also audited by the UN Board of Auditors, and donors, such as the European Union, conduct regular reviews and missions to ensure their funds are being used appropriately. Details on how UNRWA uses its funds can be found here: https://www.unrwa.org/how-you-can-help/how-we-spend-funds. For further information on the EU-UNRWA partnership, please see the EU-UNRWA factsheet and the Joint Declaration between the EU and UNRWA on European Union support to UNRWA (2017-2020). This is Liad Yitzhak, research associate with the Center for Near East Policy Research, founded as a nonprofit entity in 1952, which researches core issues of Israeli-Arab relations, providing insight into the complex reality of the Middle East to policy makers, journalists and the general public. To that end, the Center initiates press conferences and briefings at the US Congress, Canadian Parliament, Israeli Knesset, the UN Correspondents Association in New York and the National Press Club in Washington. The Center enjoys a cordial relationship with the office of the Secretary General of the UN. Since 1988, the Center has commissioned top-flight journalists, film makers, academics and researchers, to publish investigative reports and documentary films which call attention to the plight of Arab refugees from the 1948 war, relegated to life in 59 “temporary” refugee camps run by The United Nations Relief and Works Agency for Palestinian Refugees (UNRWA). The Center for Near East Policy Research is now producing a report on the plight of the UNRWA population in the calendar year 2019. As a donor nation to UNRWA, we would like to inquire about the planned aid programs of the European Union for UNRWA. How much funding does the European Union plan to allocate to UNRWA during 2019? Will the European Union work to moderate the war curriculum used in UNRWA schools? Will the European Union work to reduce or eliminate the Hamas terror presence in UNRWA? Will the European Union introduce transparency oversight of make sure that humanitarian donations to UNRWA are not siphoned into terror and organized crime? The EU and its Member States, like the Netherlands, are proud to support UNRWA’s work in providing essential services to Palestine refugees, which should be seen as an inseparable part of the EU’s efforts to reach a negotiated two-state solution and a just and lasting peace between Israel and the Palestinians. Please see also the Statement by the Spokesperson on UNRWA from 1 September 2018. This is Liad Yitzhak, research associate with the Center for Near East Policy Research, founded as a non profit entity in 1952, which researches core issues of Israeli-Arab relations, providing insight into the complex reality of the Middle East to policy makers, journalists and the general public. As a donor nation to UNRWA, we would like to inquire about the planned aid programs of the Netherlands for UNRWA. How much funding does the Netherlands plan to allocate to UNRWA during 2019? Will the Netherlands work to moderate the war curriculum used in UNRWA schools? Will the Netherlands work to reduce or eliminate the Hamas terror presence in UNRWA? Kindly note that information on Finland’s humanitarian funding including funding to UNRWA is available on our foreign ministry’s website https://um.fi/humanitarian-aid . As a donor nation to UNRWA, we would like to inquire about the planned aid programs of Finland for UNRWA. How much funding does Finland plan to allocate to UNRWA during 2019? Will Finland work to moderate the war curriculum used in UNRWA schools? Will Finland work to reduce or eliminate the Hamas terror presence in UNRWA? The EU and its Member States (including Poland) are proud to support UNRWA’s work in providing essential services to Palestine refugees, which should be seen as an inseparable part of the EU’s efforts to reach a negotiated two-state solution and a just and lasting peace between Israel and the Palestinians. Please see also the Statement by the Spokesperson on UNRWA from 1 September 2018. The EU and its Member States are collectively the largest contributors to UNRWA. In 2018, the EU and its Member States contributed around USD 644 million to UNRWA .UNRWA publishes its donor contributions, which can be found here: https://www.unrwa.org/how-you-can-help/government-partners/funding-trends/donor-charts. In 2018 the EU contributed around USD 179 million to UNRWA. Poland’s contribution to UNRWA in 2019 will remain unchanged. As a donor nation to UNRWA, we would like to inquire about the planned aid programs of Poland for UNRWA. How much funding does Poland plan to allocate to UNRWA during 2019? Will Poland work to moderate the war curriculum used in UNRWA schools? Will Poland work to reduce or eliminate the Hamas terror presence in UNRWA? The EU and its Member States are proud to support UNRWA’s work in providing essential services to Palestine refugees, which should be seen as an inseparable part of the EU’s efforts to reach a negotiated two-state solution and a just and lasting peace between Israel and the Palestinians. The EU and its Member States are collectively the largest contributors to UNRWA. In 2018, the EU and its Member States contributed around USD 644 million to UNRWA .UNRWA publishes its donor contributions, which can be found here: https://www.unrwa.org/how-you-can-help/government-partners/funding-trends/donor-charts. In 2018 the EU contributed around USD 179 million to UNRWA. In 2018 Denmark contributed 70 mio. DKK to UNRWAs Programme Budget and 20 mio. DKK to UNRWA’s Emergency Appeal to Syria. As a donor nation to UNRWA, we would like to inquire about the planned aid programs of Denmark for UNRWA. How much funding does Denmark plan to allocate to UNRWA during 2019? Will Denmark work to moderate the war curriculum used in UNRWA schools? Will Denmark work to reduce or eliminate the Hamas terror presence in UNRWA? As a donor nation to UNRWA, we would like to inquire about the planned aid programs of Slovenia for UNRWA. How much funding does Slovenia plan to allocate to UNRWA during 2019? Will Slovenia work to moderate the war curriculum used in UNRWA schools? Will Slovenia work to reduce or eliminate the Hamas terror presence in UNRWA? Will Slovenia introduce transparency oversight of make sure that humanitarian donations to UNRWA are not siphoned into terror and organized crime? thank you for your e-mail of 11 February in which you would like to obtain informations related to the planned programms of Slovenia for UNRWA. Slovenia contributes to UNRWA according to its foreign policy and development cooperation priorities and pledged a contribution of EUR 165,000 in the period between 2018 and 2020 at the UNRWA extraordinary ministerial conference, held on 15 March 2018 (further information available on MFA website httpČ//www.mzz.gov.si/si/yunanja_politika_in_mednarodno_pravo/mednarodno_razvojno_sodelovanje_in_humanitarna_pomoc/humanitarna_pomoc/humanitarna_pomo c_rs_2018/). https://www.unrwa.org/how-you-can-help/government-partners/funding-trends/donor-charts. In 2018 the EU contributed around USD 179 million to UNRWA. You have sent a request of information to Sweden’s embassy in Tel Aviv and the Consulate General in Jerusalem regarding Sweden’s financial support to UNRWA. Sweden entered into a multiannual strategic partnership agreement with UNRWA last year. Through the agreement, Sweden commits to 1,88 billion SEK in support to the UNRWA programme budget over a period of four years (2018-2021) with corresponds to 470 million SEK per year, approximately 50 million USD. As a donor nation to UNRWA, we would like to inquire about the planned aid programs of Sweden for UNRWA. How much funding does Sweden plan to allocate to UNRWA during 2019? Will Sweden work to moderate the war curriculum used in UNRWA schools? Will Sweden work to reduce or eliminate the Hamas terror presence in UNRWA? Will Sweden introduce transparency oversight of make sure that humanitarian donations to UNRWA are not siphoned into terror and organized crime? A number of EU Member States have reported receiving a request for information from the Center for Near East Policy Research. In order to provide coherence in EU responses, we have prepared the following text which you may find useful in your responses. Malta, like the EU and its other Member States, is proud to support UNRWA’s work in providing essential services to Palestine refugees, which should be seen as an inseparable part of the EU’s efforts to reach a negotiated two-state solution and a just and lasting peace between Israel and the Palestinians. The EU and its Member States are collectively the largest contributors to UNRWA. In 2018, the EU and its Member States ( including Malta ) contributed around USD 644 million to UNRWA, whilst the EU contributed around USD 179 million to UNRWA. Guided by the Sustainable Development Goals, specifically on health and education, Malta’s contribution aims to improve the services offered to refugees. Malta believes the UN is the best organisation to assist, protect and support the vulnerable people affected, particularly in the fields of education and health care. Malta’s total contribution towards UNRWA for the year 2019 will be determined by the situation in the region as well as the needs therein. Malta understands that by providing the necessary help to improve people’s lives, stability in the region can also be enhanced. Like the EU and its Members States of which Malta forms part, Malta is aware that UNRWA has rigorous processes and mechanisms in place for the implementation and enforcement of its rules, regulations and policies relating to UN neutrality. This includes biannual checks of staff names against the relevant UN sanctions list and regular inspections of its installations. Through its education programme, UNRWA also promotes universal values and the principles of the United Nations, and a system is in place to ensure that the host governments’ curricula implemented in UNRWA schools reflect these values. By implementing its activities directly through its own staff, UNRWA maintains strong control over the spending of donor funds. UNRWA is also audited by the UN Board of Auditors, and donors, such as the European Union, conduct regular reviews and missions to ensure their funds are being used appropriately. As a donor nation to UNRWA, we would like to inquire about the planned aid programs of Malta for UNRWA. How much funding does Malta plan to allocate to UNRWA during 2019? Will Malta work to moderate the war curriculum used in UNRWA schools? Will Malta work to reduce or eliminate the Hamas terror presence in UNRWA? The EU and its Member States are supporting UNRWA’s work in providing essential services to Palestine refugees, which should be seen as an inseparable part of the EU’s efforts to reach a negotiated two-state solution and a just and lasting peace between Israel and the Palestinians. Please see also the Statement by the Spokesperson on UNRWA from 1 September 2018. As a donor nation to UNRWA, we would like to inquire about the planned aid programs of Lithuania for UNRWA. How much funding does Lithuania plan to allocate to UNRWA during 2019? Will Lithuania work to moderate the war curriculum used in UNRWA schools? Will Lithuania work to reduce or eliminate the Hamas terror presence in UNRWA? As a donor nation to UNRWA, we would like to inquire about the planned aid programs of Spain for UNRWA. How much funding does Spain plan to allocate to UNRWA during 2019? Will Spain work to moderate the war curriculum used in UNRWA schools? Will Spain work to reduce or eliminate the Hamas terror presence in UNRWA? Will Spain introduce transparency oversight of make sure that humanitarian donations to UNRWA are not siphoned into terror and organized crime? Let me first thank you for your interest in the Belgian aid policy and on our support to UNRWA. Thank you for your correspondence received on the 23 February. The UK are proud to support UNRWA’s work in providing essential services to Palestine refugees, which should be seen as an inseparable part of efforts to reach a negotiated two-state solution and a just and lasting peace between Israel and the Palestinians. The UK are a top five donor to UNRWA. In 2018 the UK contributed £65.5 million to UNRWA .UNRWA publishes its donor contributions, which can be found here: https://www.unrwa.org/how-you-can-help/government-partners/funding-trends/donor-charts. UNRWA has rigorous processes and mechanisms in place for the implementation and enforcement of its rules, regulations and policies relating to UN neutrality. This includes biannual checks of staff names against the relevant UN sanctions list and regular inspections of its installations. Through its education programme, UNRWA also promotes universal values and the principles of the United Nations, and a system is in place to ensure that the host governments’ curricula implemented in UNRWA schools reflect these values. By implementing its activities directly through its own staff, UNRWA maintains strong control over the spending of donor funds. UNRWA is also audited by the UN Board of Auditors, conduct regular reviews and missions to ensure their funds are being used appropriately. Details on how UNRWA uses its funds can be found here: https://www.unrwa.org/how-you-can-help/how-we-spend-funds. As a donor nation to UNRWA, we would like to inquire about the planned aid programs of the United Kingdom for UNRWA. How much funding does the United Kingdom plan to allocate to UNRWA during 2019? Will the United Kingdom work to moderate the war curriculum used in UNRWA schools? Will the United Kingdom work to reduce or eliminate the Hamas terror presence in UNRWA? Will the United Kingdom introduce transparency oversight of make sure that humanitarian donations to UNRWA are not siphoned into terror and organized crime? Thank you for your email of 2 January 2019 regarding Australia’s partnership with the United Nations Relief and Works Agency for Palestine Refugees in the Near East (UNRWA). Australia has been a long-standing supporter of UNRWA and has provided funding every year since 1951. The Government’s current AUD$80 million multi-year funding agreement (2016-2020) with UNRWA is a tangible demonstration of our assistance to Palestinian refugees. We are confident that UNRWA continues to play an important role in maintaining a degree of social and economic stability in the region. Australia’s aid program is subject to regular and extensive oversight of financial and program accountability. Australia has a strong focus on performance reporting, evaluation, innovation and research. Australia’s aid program in the Palestinian Territories is subject to further rigorous systems to ensure that all activities are comprehensively monitored and pro-actively managed. The Australian Government is committed to ensuring that all Australian aid is used for its intended purposes. Australia has zero tolerance approach to any funding or support to terrorist affiliated organisations. The Department of Foreign Affairs and Trade (DFAT), has robust counter-terrorism arrangements and due diligence requirements to prevent Australian aid from going directly or indirectly to terrorists or people linked to terrorist organisations. Warm greetings in the new year. This is Liad Yitzhak, research associate with the Center for Near East Policy Research, which produces films, monographs and on the UNRWA refugee camp facilities. Our reports reach the UN, the Knesset Lobby for UNRWA reform, along with all nations that donate generously to UNRWA. We read (at https://aijac.org.au/fresh-air/australian-aid-to-palestinians-where-does-it-go/)that Australia provided 43 million dollars for UNRWA humanitarian aid over the past calendar year. What supervisory measures are taken by the Australian Government to ensure that the aid provided to UNRWA will be used for its intended humanitarian purposes? What steps being taken by Australia to ensure that aid to UNRWA is distributed in an efficient and transparent manner? Our Palestinian researcher would like to visit and file on location reports about Australian aid to UNRWA, if that would be possible. Thank you for your email of 23 February. New Zealand remains firmly committed to supporting the United Nations Relief and Works agency for Palestine Refugees in the Near East (UNRWA). Our contribution of NZ$1 million in core funding per year recognises that UNRWA continues to make a positive, concrete difference in the lives of the people it serves. UNRWA provides important services to Palestinian refugees in the Middle East such as health care and education. It also addresses significant unmet humanitarian needs for Palestinian populations. This is a significant humanitarian mission, but also supports peace and security between Israelis and Palestinians, as well as stability in regional host countries. In addition to our core contribution, New Zealand made two additional one-off contributions to UNRWA’s emergency appeals for the Syrian Regional Refugee Crisis, and to address the humanitarian situation in Gaza. As you note, this brought our total contributions to UNRWA to NZ$3.9 million in 2018. New Zealand receives annual consolidated reporting from UNRWA, detailing results and achievements and how funding has been spent. As a donor nation to UNRWA, we would like to inquire about the planned aid programs of New Zealand for UNRWA. How much funding does New Zealand plan to allocate to UNRWA during 2019? Will New Zealand work to moderate the war curriculum used in UNRWA schools? 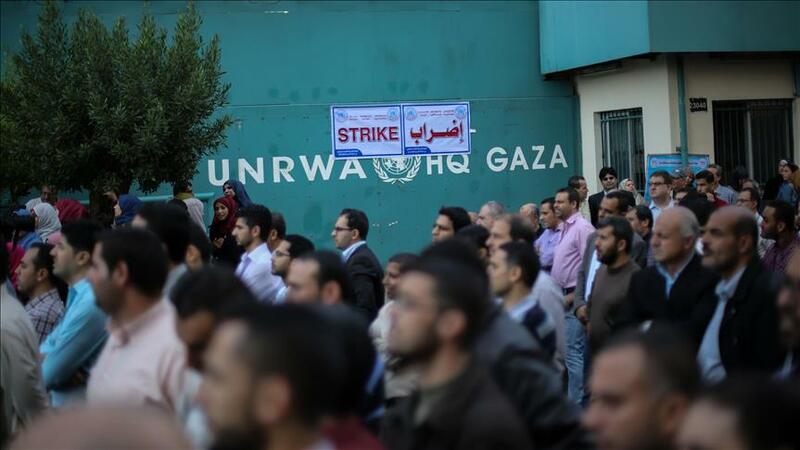 Will New Zealand work to reduce or eliminate the Hamas terror presence in UNRWA? Will New Zealand introduce transparency oversight of make sure that humanitarian donations to UNRWA are not siphoned into terror and organized crime? Please, be informed that Ukraine doesn’t have any programmes with UNRWA and doesn’t participate in any activities regarding UNRWA. As a donor nation to UNRWA, we would like to inquire about the planned aid programs of the Ukraine for UNRWA. How much funding does the Ukraine plan to allocate to UNRWA during 2019? Will the Ukraine work to moderate the war curriculum used in UNRWA schools? Will the Ukraine work to reduce or eliminate the Hamas terror presence in UNRWA? I hope this information is of use for your research. As a donor nation to UNRWA, we would like to inquire about the planned aid programs of Mexico for UNRWA. How much funding does Mexico plan to allocate to UNRWA during 2019? Will Mexico work to moderate the war curriculum used in UNRWA schools? Will Mexico work to reduce or eliminate the Hamas terror presence in UNRWA? Will Mexico introduce transparency oversight of make sure that humanitarian donations to UNRWA are not siphoned into terror and organized crime? thank you for your email. In reference to your enquiry, I can confirm that Italy’s financial contribution to UNRWA is managed according to the rules set by the agreements stipulated with the Agency, which require checks on how said contribution is spent through regular auditing and reporting obligations. As a donor nation to UNRWA, we would like to inquire about the planned aid programs of Italy for UNRWA. How much funding does Italy plan to allocate to UNRWA during 2019? Will Italy work to moderate the war curriculum used in UNRWA schools? Will Italy work to reduce or eliminate the Hamas terror presence in UNRWA? Will Italy introduce transparency oversight of make sure that humanitarian donations to UNRWA are not siphoned into terror and organized crime?